Our inboxes have been bursting with emails and suggestions for new designs. You know what that means: It's a request-fest! ALL of this week's new designs are inspired by you -- and we're head over heels for your suggestions! Scroll down the page to see the variety, and let your creativity run wild. 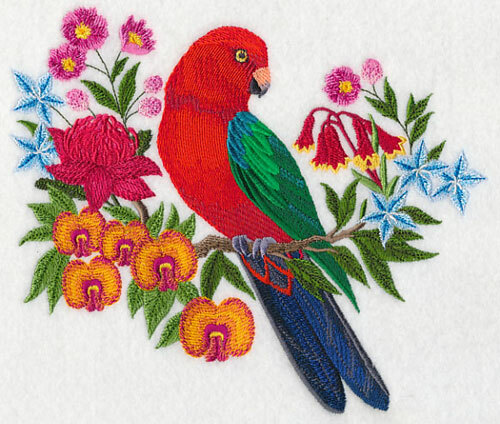 Brilliantly colored parrots, new tennis and golf designs, crafty quilting blackwork, adorable lovebirds, and more are all available. Thanks for all your excellent suggestions! We love showing off your fabulous design ideas. 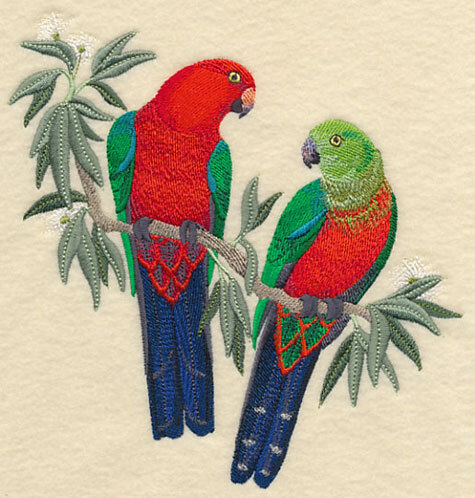 Beautiful, colorful Australian King Parrots are commonly found in gorgeous subtropical rainforests. 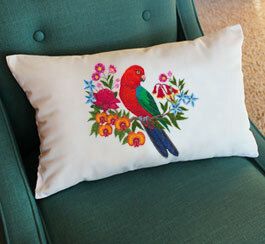 Freda loves the majestic birds, and was hoping we could add a few designs featuring them to our collection. Here, a lone parrot perches amongst tropical flowers and blooms native to its home, including pink sunray wildflowers, waratah, flame peas, and Tasmanian Christmas bells. 7.71" x 6.89" and 6.57" x 5.87" and 5.47" x 4.89"
Australian King Parrots mainly stick to forested regions of Australia, including wooded areas full of eucalyptus trees. They feed on fruits and seeds gathered from trees or on the ground. Here we depicted a pair of the birds sitting on a eucalyptus branch, one male and one female. The male is known for his red head, breast, and lower undersides, while the female has a green head and breast and a grey beak. 6.88" x 7.36" and 5.85" x 6.26" and 4.85" x 5.19"
Deborah is crafting a coastal-theme quilt for her brother, and was searching for sea oats designs to add to the project. Here you go, Deborah! 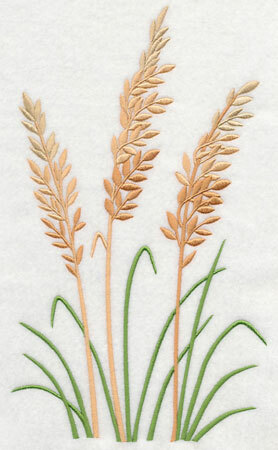 The lovely oceanfront grass is depicted two ways: swaying lightly in the breeze and standing upright. 6.55" x 11.75" and 5.24" x 9.41"
6.86" x 11.38" and 5.67" x 9.40"
4.71" x 7.80" and 4.14" x 6.85"
Not only did we add a pair of stand-alone sea oats designs, but we also created a border of the seafront plant as well. 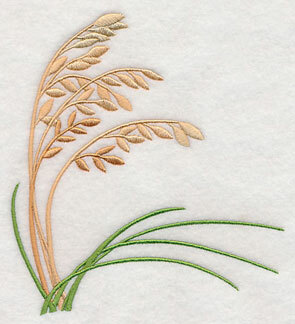 We opted for depicting the subtropical grass with large, golden brown seed heads -- generally this coloring occurs in late summer, and it is how the plant got its name. 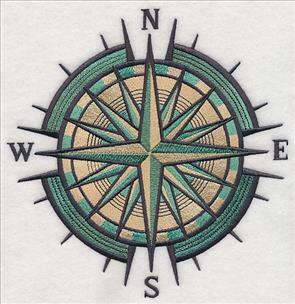 11.75" x 4.32" and 9.42" x 3.46" and 7.82" x 2.88" and 6.00" x 2.47" and 3.88" x 1.89"
Finish your sea oats series with a corner design, perfect for stitching on pockets, placemats, quilts, and more! 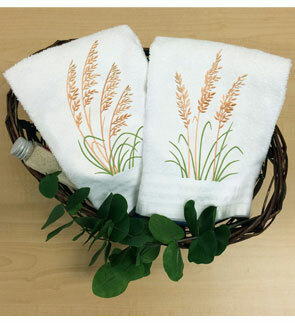 5.87" x 6.46" and 4.86" x 5.35" and 3.51" x 3.86"
The sea oats designs are wonderful choices for a pair of towels; give them with sea salts and lotion for a fantastic gift basket! 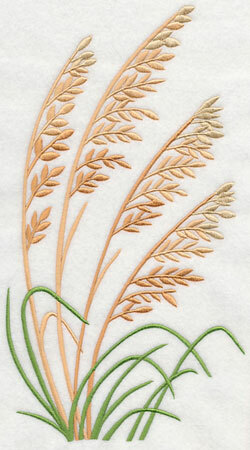 Stitch these sea oats designs on a variety of projects, including tote bags, quilts, pillows, and more. Pick your favorites by using the links above, or get all of the designs in a design pack. 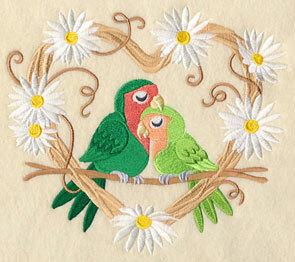 Becky was inspired by the idea of darling lovebirds snuggling in grapevine wreaths, and so were we! 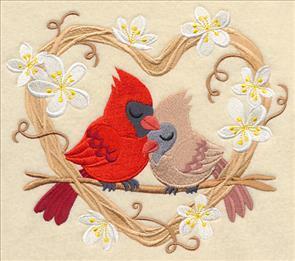 Cardinals, chickadees, doves, and rosy-faced lovebirds all find a friend inside floral hearts. 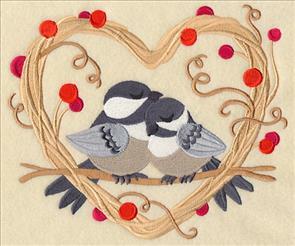 Stitch the sweet designs on pillows, quilt squares, tote bags, and aprons. 7.81" x 6.81" and 6.72" x 5.86"
7.81" x 6.61" and 6.92" x 5.86"
5.71" x 4.83" and 3.86" x 3.27"
Give a simple pillow sweet character with one of these lovely bird designs. 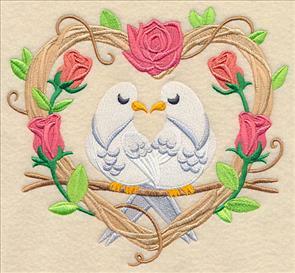 The precious bird couples are adorable options for stitching embroidery projects (and especially for anniversaries, weddings, and Valentine's Day). 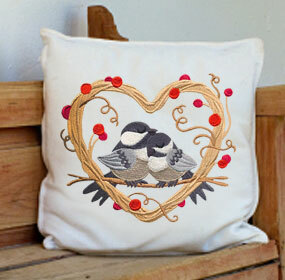 We love the idea of adding them to a gift for someone you love! Thanks for the inspiration, Becky! 7.54" x 6.91" and 6.39" x 5.86"
7.79" x 6.90" and 6.61" x 5.85"
5.51" x 4.88" and 3.86" x 3.41"
Everybody loves tennis! We've had lots and lots of emails come in with requests for the fun and action-packed sport. 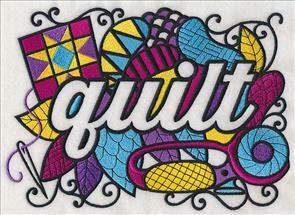 Michelle suggested we create designs similar to our Bowling a Strike designs, and we agreed! Each of the new tennis designs comes in a cool, retro style. 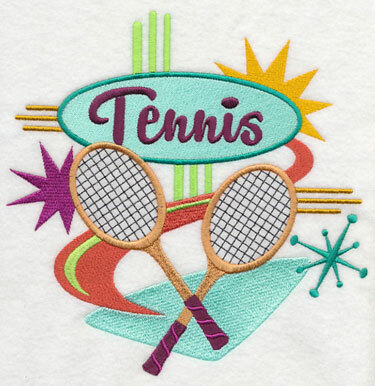 7.81" x 7.78" and 6.88" x 6.85" and 5.88" x 5.85" and 4.86" x 4.84" and 3.86" x 3.84"
Our tennis racket and ball medleys are terrific choices for adorning sports bags, sweatshirts, racket covers, and more. 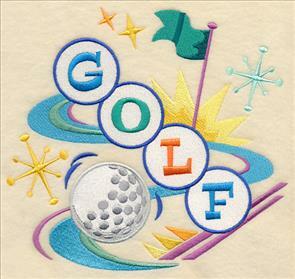 The bright colors and retro-style imagery are a playful approach to embroidering for the exciting sport. 8.90" x 6.85" and 7.81" x 6.01"
7.07" x 5.44" and 6.31" x 4.86"
Give your athletic bag a fun update with one of the new tennis designs! 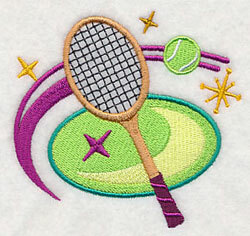 Add this funky tennis border to your towels, sports bags, clothes, and more! 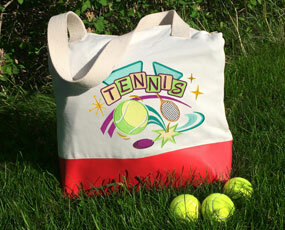 The bright colors and fun embellishments make it a terrific option for showing you "love" tennis. 11.75" x 3.24" and 9.41" x 2.59" and 7.81" x 2.15" and 6.00" x 1.90" and 3.01" x 1.63"
Finish off your tennis design collection with these retro-cool tennis racket and ball designs. On the left is a corner, perfect for towel edges, shirt pockets, and more. 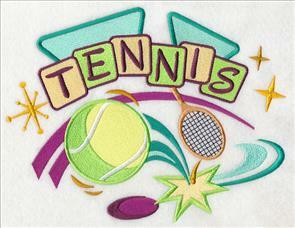 A stand-alone tennis medley is on the right; we love it on athletic jackets, bags, and towels. 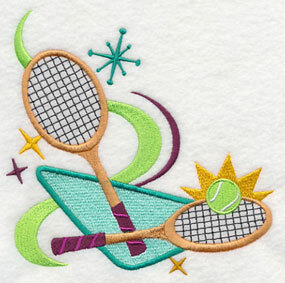 Show your love for tennis with a series of designs that'll knock you out of the court! Pick your favorite designs, or get them all in a design pack for an even larger discount! 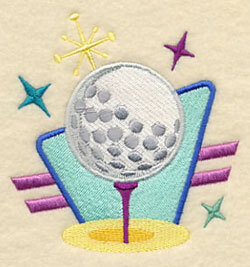 You all are just as excited about golf as you are about tennis, so we've added a slew of retro-style golf designs, too! Whether you're after a hole in one or just showing off your favorite hobby, these cool designs are the perfect choice for tote bags, golf towels, and more. 7.79" x 7.23" and 6.92" x 6.42"
6.29" x 5.84" and 5.22" x 4.85"
8.30" x 6.90" and 7.55" x 6.28"
6.99" x 5.82" and 5.84" x 4.86"
A colorful border spells G-O-L-F in big, typewriter-style letters; crossed golf clubs and a golf ball finish the design. 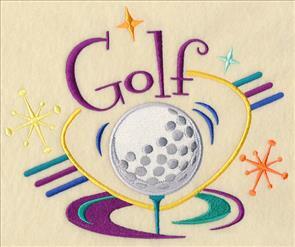 Stitch the border onto towels, athletic apparel, and more! 11.75" x 4.31" and 9.41" x 3.46" and 7.81" x 2.87" and 6.00" x 2.46" and 3.87" x 1.44"
A golf corner design is a great way to spice up shirt pockets, sports towels, and golf club headcovers. 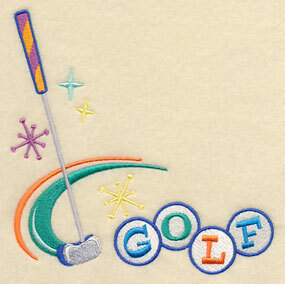 Try the single golf ball design for jacket backs, polo shirt sleeves, or other sporting supplies! Pick your favorite styles and sizes by using the links above, or get the whole set in a design pack! 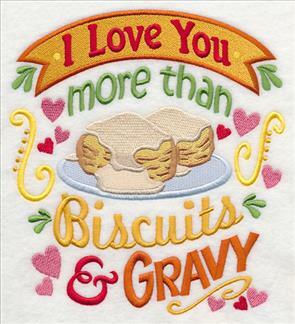 Cute, clever sayings are an eye-catching way to serve up fun kitchen decor! 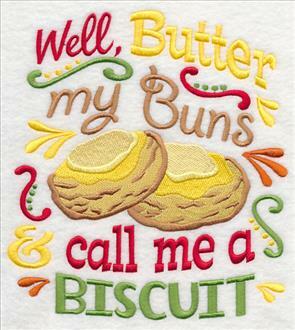 Stitch these adorable biscuit-inspired designs on aprons, placemats, framed wall pieces, and more. 6.90" x 7.63" and 5.86" x 6.48"
6.90" x 7.59" and 5.86" x 6.45"
4.86" x 5.35" and 3.51" x 3.87"
Joyce needed a design featuring just a warm, flaky biscuit with a slice of butter on top. 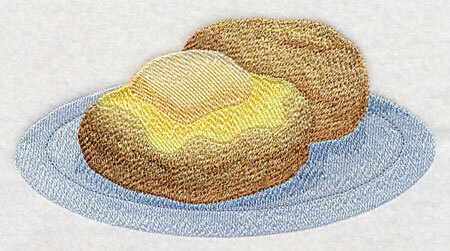 We loved the idea, and created this tasty design. Thanks for writing in, Joyce! 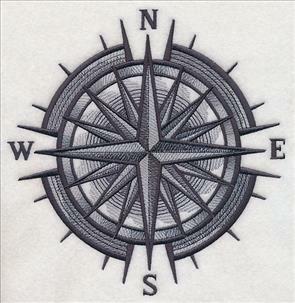 6.84" x 3.61" and 3.84" x 2.03"
Diane was interested in adding a mariner's compass to her embroidery projects, but couldn't find a design to fit. We gave her two options of the nautical emblem to choose from: a colorful version, and a sketch-style design. 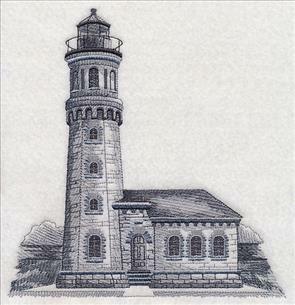 7.64" x 7.80" and 6.76" x 6.90"
5.74" x 5.86" and 4.76" x 4.86"
The Fort Niagara Light is the lighthouse that sits on shores of the Niagara River and Lake Ontario in New York. The beautiful building is made up of limestone and brick, and the majestic tower is octagonal with a black lantern. 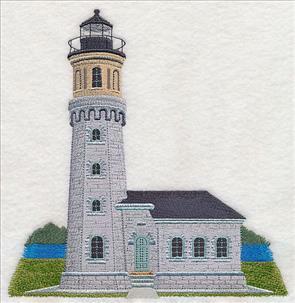 Diane thought this would be a stunning addition to our lighthouse designs, and boy, she was right! Thanks, Diane! 7.71" x 7.80" and 6.89" x 6.97"
7.57" x 7.80" and 6.90" x 7.13"
5.85" x 6.04" and 4.85" x 5.01"
Both Sarah and Donna love our Crafty Blackwork series, and were hoping we'd add a quilting design, too. Of course we can! 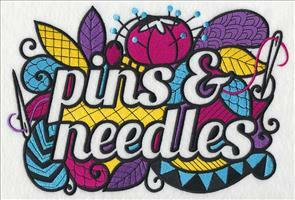 Not only did we add the craft-tastic quilting design, but we've added a new pins and needles option, too. Thanks for the suggestion, Sarah and Donna! 10.25" x 6.91" and 8.69" x 5.86"
7.82" x 5.27" and 6.87" x 4.63"